Wójcik Racing Team won the EWC Dunlop Independent Trophy at the Bol d’Or. The Polish squad finished 11th overall at the opening round of the 2018-2019 season of the FIM EWC to pocket the €5,000 cash prize earmarked for the winner, ahead of BMRT 3D Maccio Racing and Zuff Racing Team. 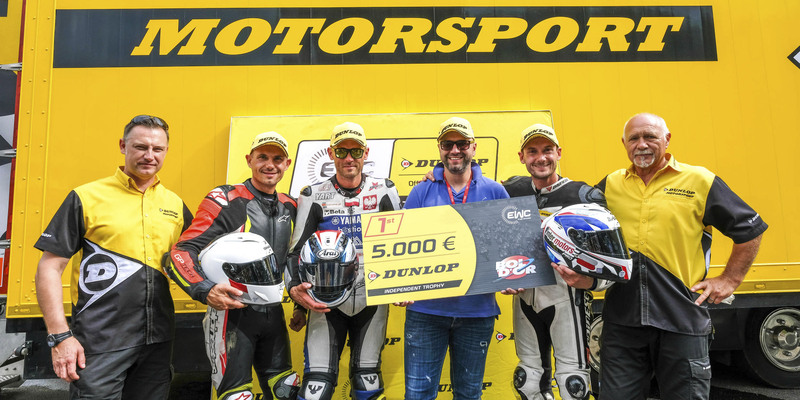 Jointly organized by Eurosport Events, Dunlop and the promoters of the various FIM EWC races, the EWC Dunlop Independent Trophy is open to private teams without the backing of a manufacturer. A total amount of €120,000 in prize money will be awarded over the upcoming season’s five races. Team Frontier placed 20th at the finish of the Suzuka 8 Hours to lift the EWC Dunlop Independent Trophy. The Japanese team finished ahead of Wójcik Racing Team and another Japanese squad, Yamashina Kawasaki. Moto Ain pulled off a flawless performance at Oschersleben, placing 6th at the finish and notching up a double victory – the Superstock win and the EWC Dunlop Independent Trophy. Moto Ain finished ahead of Tati Team Beaujolais Racing and Mototech EWC Team after running an outstanding race in Germany. Atomic 68’s recent switch to Dunlop got them instant returns. The team won the EWC Dunlop Independent Trophy ahead of Polish squad Wójcik Racing Team and Tati Team Beaujolais Racing following a hotly disputed 2nd edition of the 8 Hours of Slovakia Ring. Moto Ain was seventh past the finish line at the 24 Heures Motos, and also stood on the second step of the Superstock podium. Roberto Rolfo, Alexis Masbou and Christoffer Bergman carried off the Dunlop Independent Trophy ahead of Tati Team Beaujolais Racing, the trophy winner at the Bol d’Or, and Team R2CL. Fourth past the finish line at the Bol d’Or, Völpker NRT48 Schubert Motors by ERC galvanized the end of the race. The private BMW team’s rider Lucy Glöckner fought an epic duel with permanent team Honda Endurance Racing’s Sébastien Gimbert, who made third place by a whisker. 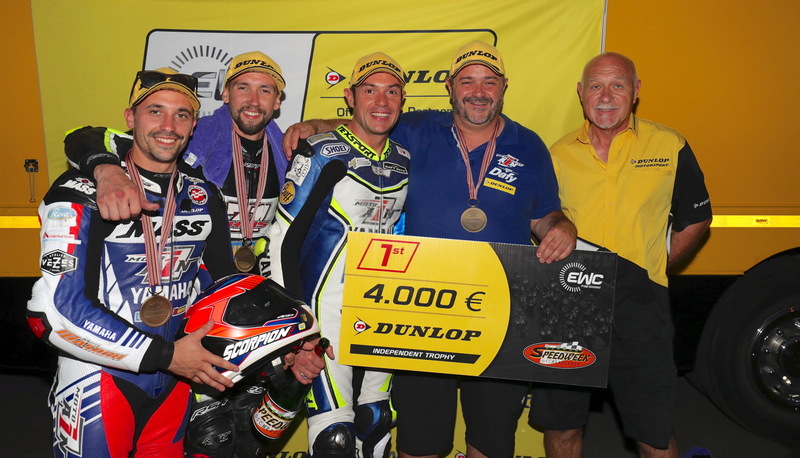 Glöckner’s spectacular feat won the German team the EWC Dunlop Independent Trophy and €5,000 in prize money. One of the few Superstock teams on the Suzuka 8 Hours starting grid, KRP Sanyo Kogyo & RS-Itoh finished the race in 22nd place, coming in ahead of EWC teams Clever Wolf Racing & 3ART and HKC & IMT Racing to win the EWC Dunlop Independent Trophy. Fourteen Japanese teams will face off at the EWC Dunlop Independent Trophy at the Suzuka 8 Hours, the 2016-2017 FIM EWC final to be raced this Sunday in Japan. A total of €20,000 of prize money will be awarded to the top ten Dunlop-shod teams past the finish line. Fifth past the finish line at the 8 Hours of Slovakia Ring, Völpker NRT48 Schubert Motors by ERC snatched the Superstock victory in Slovakia and carried off the EWC Dunlop Independent Trophy for the first time, winning a €4,000 cash prize. The squad triumphed over AM Moto Racing Compétition and Tati Team Beaujolais Racing at the 1st edition of the 8 Hours of Slovakia Ring.